the very successful track record you have had or is it a repeating pattern that you are unable to shake off? In either case, it will benefit you take a step back and evaluate what possibly went amiss in your journey from the very realistic plan you hoped to achieve to the very disappointing year-end report card. The business model of your company is the architecture on how you provide value to your clients. It integrates the mission of the organization with its values to give a unique proposition to your clientele, in exchange for the price you charge for the products or services. If you are in network marketing or a distributor of a company the business model is by and large packaged and presented to you. However, here too there could be slip-ups in following through, or omitting some important nuances while providing the products or services. Entrepreneurs become more vulnerable in this area when they are providing products or services under their own brand. Most entrepreneurs have a business model that takes shape by default, using the trial and error method, as entrepreneurs find their way to their prospective clients. Faulty default business models are either make-do models and have a lot of inefficiencies built in or may work for a span of time, before becoming redundant and resulting in disappointment. A good health check for your business model is to examine the breakeven point and evaluate your marketing strategy on the 7Ps of marketing: Product, Price, Promotion, Place, People, Process and Physical Evidence. Ask yourself: Did you research your market and competitors before articulating the 7Ps? Which P gives you the unique strength to woo your dream client? Which P is a weak link in your business model? Have you leveraged all the Ps to increase the strength of your business? Setting passionate goals: You must have heard repeatedly about SMART goals. The A (Achievable) component of SMART is a critical element in determining whether a goal will be achieved or not. There are two kinds of goal setters, some set goals to sustain their lifestyle or their business and the goal variables are driven by their need to retain status co and pay the bills. Others are driven by a need to achieve, grow and prosper. This need is a powerful driver and entrepreneurs driven by this need will overcome any obstacle to achieve their goals. When a particular goal either triggers no emotions, stress, or even fear, the likelihood that the goal will be achieved is low. However, if the goal gives you a feeling of elation and excitement, more likely than not you will achieve or even exceed that goal. 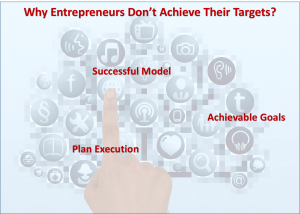 Executing the plan: According to Ram Charan, 70% of the strategies fail due to poor execution. There are 4 crucial elements of execution. First, break down goals to the smallest level possible. Second, commit resources to every key result area (KRA). Third, make people (self) accountable for each and every critical aspect and lastly, put a regular review and course correction process in place. Problems arise when you take the review process lightly and do not hold key individuals or yourself accountable for the results. Some interesting questions entrepreneurial leaders can ask themselves: do I and my team believe that the goals are achievable? Are we passionately engaged in achieving the goals? Are we really looking forward to the successes this achievement will bring us? If yes, are we truly putting in our best to get to the winning post? If none of the above areas have been a challenge for you, then you need to ask yourself, what is the one thing I need to change that will improve my business by 20 to 50%? Dig deep, as you definitely have the answer….as an entrepreneur, you always know the answer to this question, the real question is what are you willing to do about it?